In an intriguing find, scientists associated with Nasa’s Dawn spacecraft have discovered a mysterious disappearance of a significant number of large craters on dwarf planet Ceres, indicating something has happened to it. Nasa’s Dawn spacecraft arrived to orbit Ceres in March 2015 and mission scientists expected to find a heavily-cratered body generally resembling the protoplanet Vesta – Dawn’s previous port of call. Instead, as the spacecraft drew near to Ceres, a somewhat different picture began to emerge: Something has happened to Ceres to remove its biggest impact basins. Now, a team of Dawn scientists led by Simone Marchi from the Southwest Research Institute in Boulder, Colorado suggest that Ceres has experienced significant geological evolution, possibly erasing the large basins. “We concluded that a significant population of large craters on Ceres has been obliterated beyond recognition over geological time scales, which is likely the result of Ceres’ peculiar composition and internal evolution,” Marchi explained in a paper published in the journal Nature Communications. None are larger than 285 km across. This presents a mystery, he says, because Ceres must have been struck by large asteroids many times over its 4.5-billion-year history. The team’s simulations of collisions with Ceres predicted that it should have 10 to 15 craters larger than 400 km in diameter, and at least 40 craters larger than 100 km wide. In reality, however, Dawn found that Ceres has only 16 craters larger than 100 km, and none larger than the 285-km Kerwan Basin. So what removed Ceres’ large craters and basins? 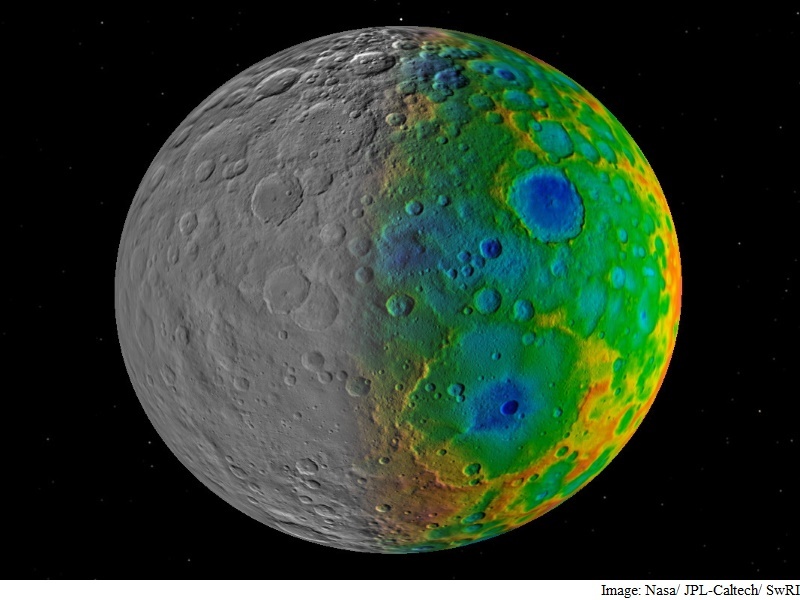 “If Ceres were highly rocky, we’d expect impact craters of all sizes to be preserved. Remote sensing from Earth, however, told us even before Dawn arrived that the crust of Ceres holds a significant fraction of ice in some form,” Williams explained. If Ceres’ crust contained a large proportion of ice – especially if mixed with salts – that would weaken the crust and let the topography of a large basin relax and become smoother, perhaps even disappear. In addition, said Williams, Ceres must have generated some internal heat from the decay of radioactive elements after it formed. This too could also have helped soften or erase large-scale topographic features. Nasa plans for Dawn to continue orbiting Ceres as the dwarf planet makes its closest approach to the Sun in April 2018. Scientists want to see if the increasing solar warmth triggers any activity or produces detectable changes in Ceres’ surface.